A new company is broadcasting funerals on the Internet, giving friends and relatives who can't make the service a chance to pay their respects. "Those who can't get to the funeral also will be able to sign the electronic guest book and e-mail condolences to the family," said Ross Johnson, promotional director for Chapelview Online, based in Rapid City. 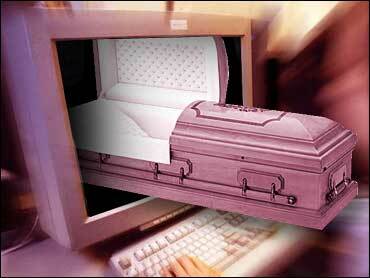 The company captures funerals with a digital camera and broadcasts them live for seven funeral homes in South Dakota. Its clients include funeral director Daryl Isburg, of Hot Springs, who heard about Chapelview during a conference and decided to give it a try. Isburg said families often ask for a tape of the service to send to loved ones who couldn't be there. Relatives and friends who want to watch it online will be given a password. "So will it come to: 'Hey, Mom's funeral got 40,000 hits?'" asked Tim Wingen, managing partner of Miller Funeral Home in Sioux Falls. "We should be there to support each other. And families really appreciate seeing someone that perhaps they haven't seen for years."